Vacation rental house. 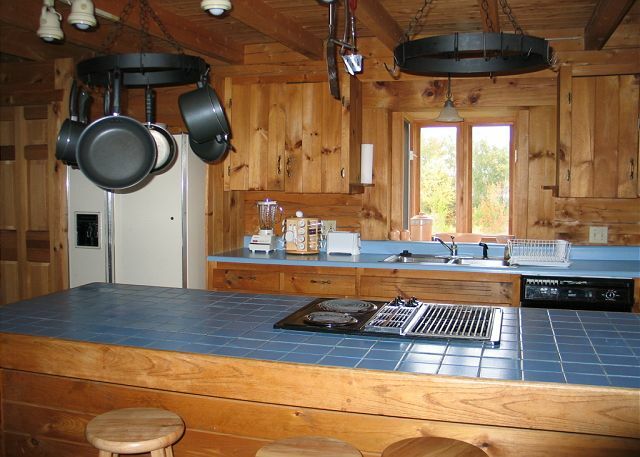 Sleeps 8, 2 bedrooms, 1.75 bathrooms. No pets allowed. The Berry Patch Place is called so because, like it's name sake, it is nicely tucked away in a thicket of woods, yet does offer some limited views of the surrounding White Mountains. 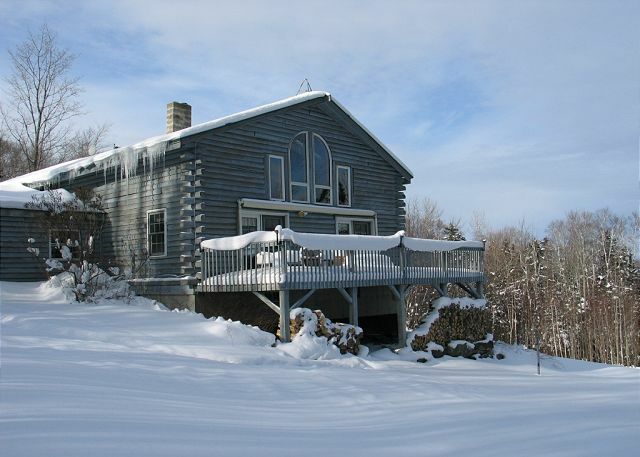 The Sugar Hill Berry Patch Place property is a tucked away safely sort of spot that is simply perfect for getting away and nestling in for your stay. Plenty of firewood will be stacked and ready to go for the soap-stone wood stove that will warm even the coldest of days. 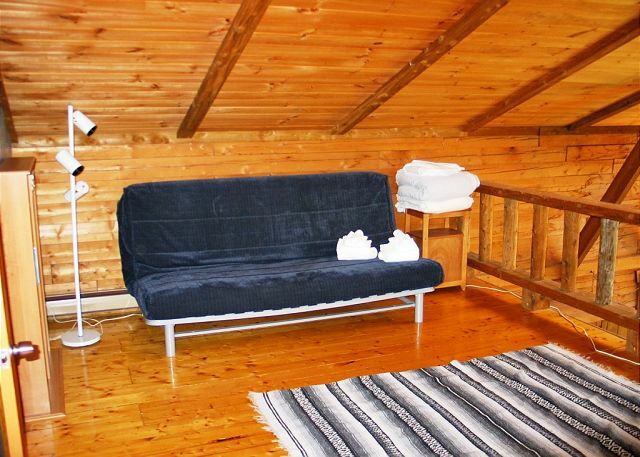 Sit back, relax and enjoy some peace and quiet at Berry Patch Place. The large yard and unspoiled surroundings of the Berry Patch Place make it a perfect location for family recreation and quiet enjoyment. 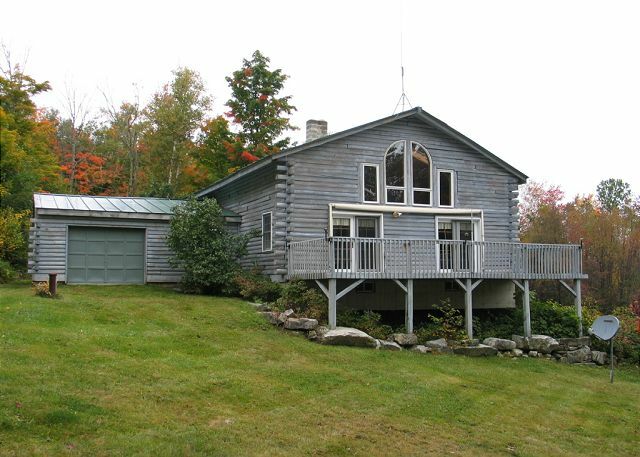 Lots of light, lots of views to the exterior, and lots of space, all leads to lots of enjoyment White Mountain style. 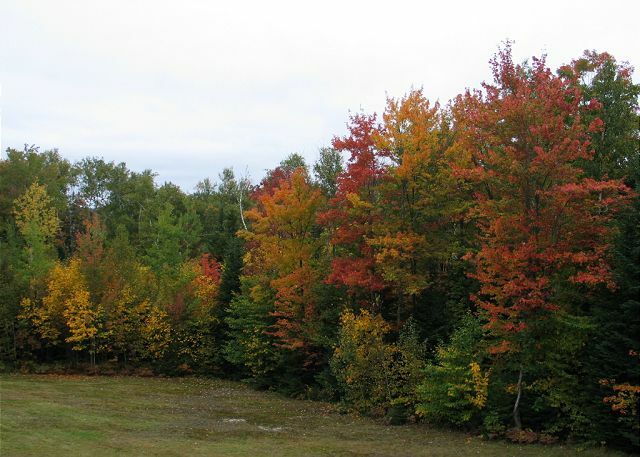 Sugar Hill, NH and the near by Franconia Notch State Park are quietly awaiting. 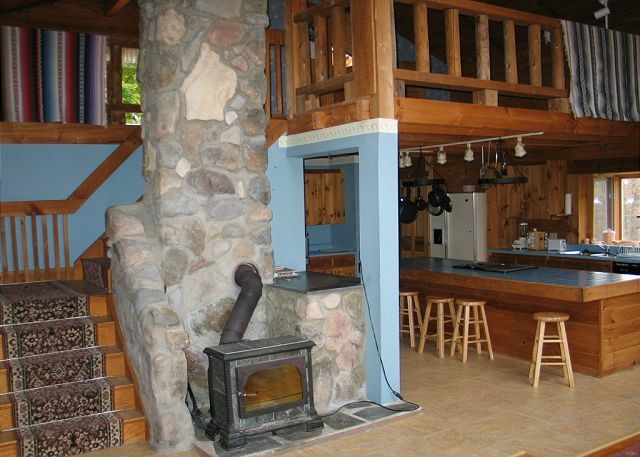 The large living space in the Berry Patch Place provides a traditional log home feel. Sugar Hill's Berry Patch Place awaits your groups' enjoyment! 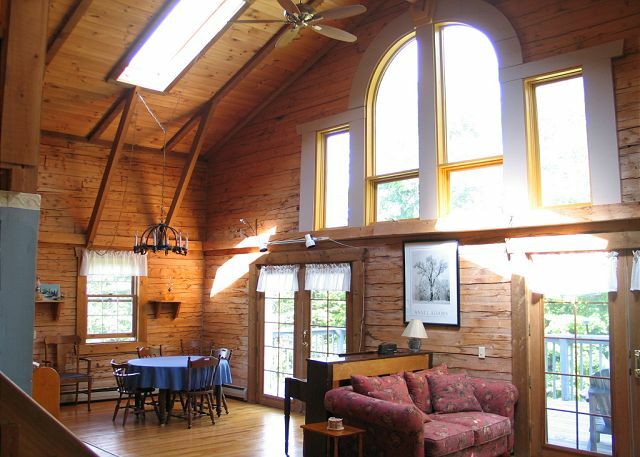 The open concept living & dining area, with vaulted ceilings above make great use of the log-home feel in the Berry Patch Vacation Rental located in Sugar Hill, NH. The grand hand made hearth and wonderful Heartstone Soap-Stone wood stove will warm not only your toes, but also your heart, as it brings this White Mountain Log Home to life. The Open concept continues through-out the interiors of this home as can be seen here. 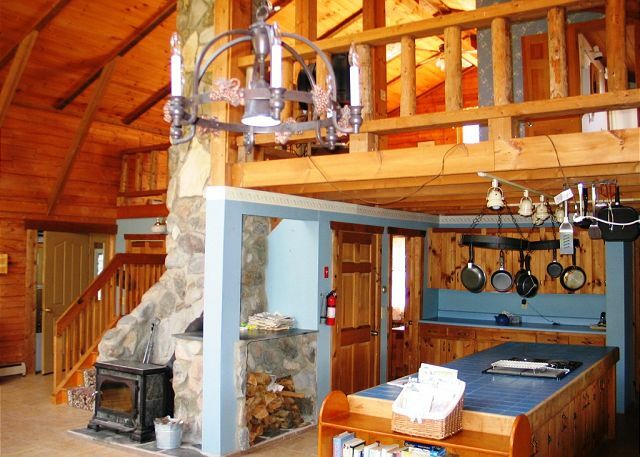 The family will be facing all the fun that this wonderful White Mountain Log Home has to offer. Two sets of french doors lead to the grand deck that features an awning for staying cool during the warm and sunny season. 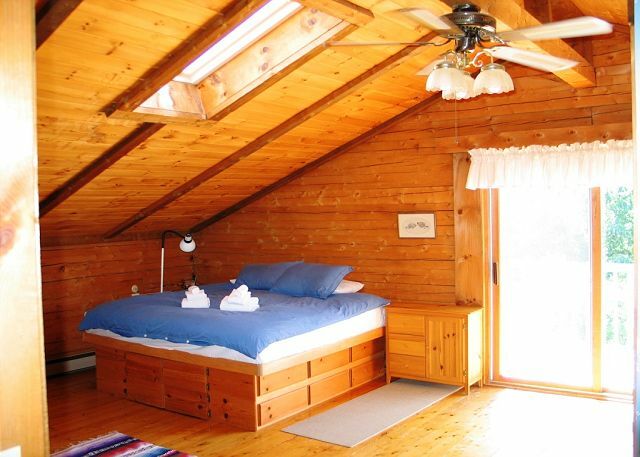 It's perfect for relaxing while taking in the fresh White Mountain air that surrounds. The kitchen opens immediately into the living & dining area, assuring easy access to family conversation. 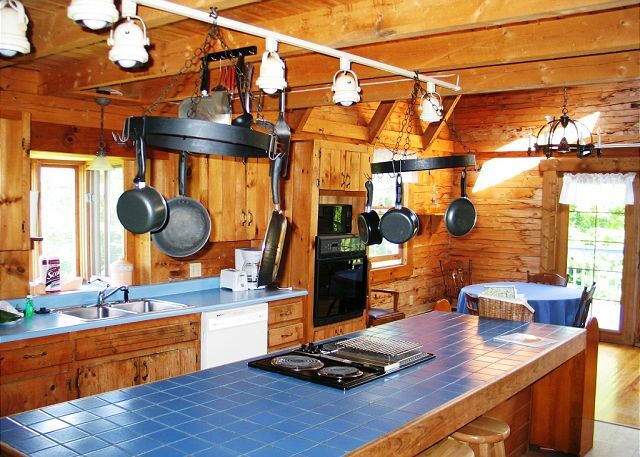 Sitting at the breakfast bar or standing at the sink to finish off the dishes, guests will be enjoying views off to north western foot-hills of NH's White Mountains. Master bedroom sleeping loft - featuring a king size bed, private balcony, and attached 3/4 bathroom. 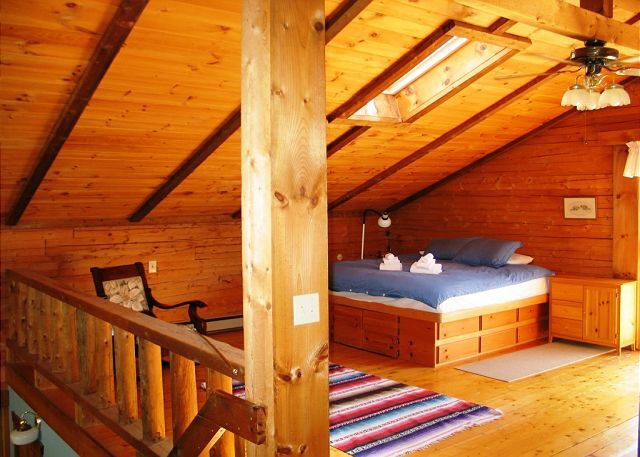 On the opposite end of the loft, you'll find a queen size pull out futon - linens included - with a TV and combination DVD/VHS player for indoor relaxation. 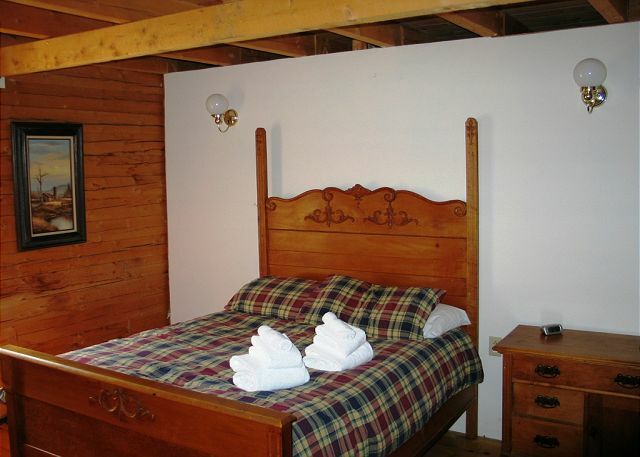 The 2nd bedroom at Berry Patch Place offers a full size bed, as well as a set of bunk beds. Main floor full bathroom, adjacent to the laundry room with washer and dryer. 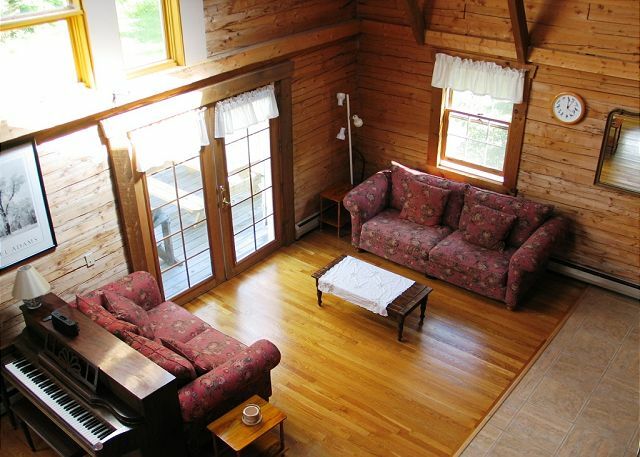 A Professionally Managed Franconia Notch Vacations Property, a traditional style and traditionally built Log Home, Sugar Hill's Berry Patch Vacation Rental awaits your quiet enjoyment. 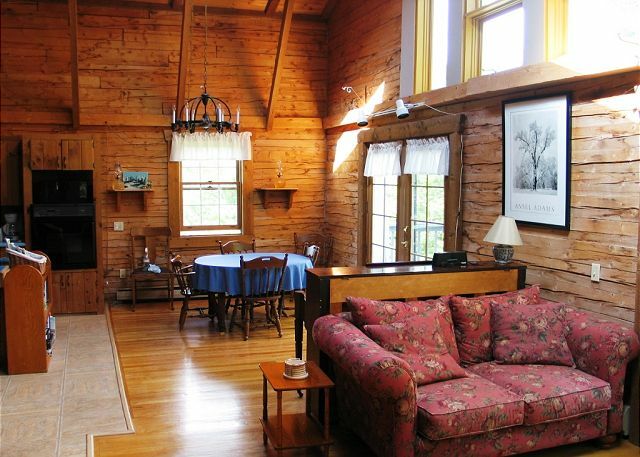 Located in an almost forgotten corner of Sugar Hill, NH, yet just 12 miles from Cannon Mountain, Echo Lake and all that Franconia Notch State Park has to offer. The warmly finished interiors include a large field stone hearth that has been matched to a Soap Stone wood stove, providing both aesthetic and ambient enjoyment. This forms the center piece of the main living and dining areas, which are open concept giving a large and airy feel to the home. However, the double doors leading to the deck that is immediate to the living area and the grand windows above play their own part in bringing a light, warm and "woody" feel to this home. One large loft style King size bedroom with is own 3/4 bath make up the master suite, where on the main floor the second bedroom offers a full size bed and a set of twin bunks, along with a second full size bath. My family had a blast at Berry Patch during the 2015/2016 ski season. 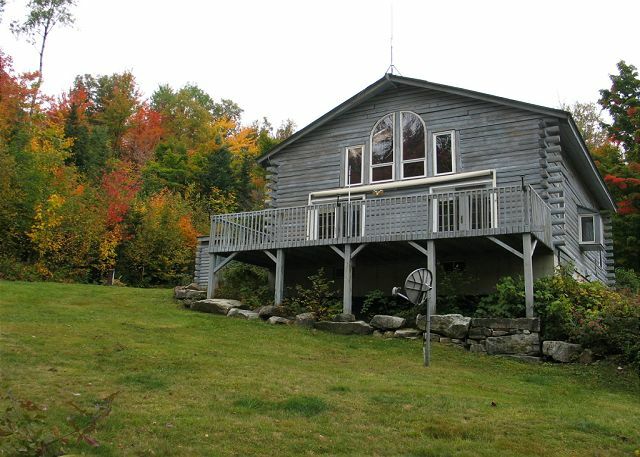 The home is cozy and warm located in a spectacular part of the White Mountains! The location was amazing. Franconia is a perfect getaway if you are looking for seclusion and wonderful mountain scenery. The tiny village of Sugarhill is a romantic step back in time. I don't imagine it has changed much over the years. We went in the summer and I believe it's full splendor would probably be seen in Autumn. We're going back someday when the fall leaves are at their peak. The house is beautiful, with a great open flow. I loved it so much I entertained the idea of building a home with the same layout the whole time I was there. As with any rental there were a couple minor hiccups but the staff were extremely helpful and FAST to respond to any issue. Infact, everyone we met in Franconia region were super nice and helpful.Since it's someone's home, it is equipped with everything...seriously, just take your clothes and food. I read other reviews on this rental that complained about the squeeky upstairs floor and heat upstairs. It's a lived in house, not the Hilton. The floors squeeked ustairs yes. To me me, it adds to the character. It would be hot if you leave the upstairs closed off, but I don't understand why that person didn't just open the patio doors upstairs. It is 2 stories off the ground, with a meshed screen, so no critters can get in. This worked for us to let the heat out. If you are looking for quiet this is the place. Be warned there is no cell phone reception, no cable, no wifi. There is however, an ipod dock, a t.v and VCR and a decent movie collection. I do think they should upgrade to DVDs :)We loved being disconnected from our cells and ipads and all the other gadgets because it allowed us to reconnect as a family. We'll definitely return to Berry Patch (oh and yes, they do have wild strawberries). ;). Thank you so much for your thoughtful and well detailed review Mr. Sirrat!! So glad you enjoyed your time in the mountains as you'd hoped!! Cort was wonderful and answered all my questions. When we arrived at the house it was dark, so we really appreciated that the exterior lights were put on for us. The heat was on as well, which was great. The house was very clean and well stocked. A set of clean towels with individual soaps were provided for every pillowcase, along with bed linens. It was like maid service in a hotel. The wood burning stove made are evenings cozy and we enjoyed being together cooking, playing board games, playing the piano and watching DVDS. It was a perfect winter get away! Our intention was to have a stress-free relaxing get-a-way weekend and that's exactly what we got. We were a little anxious knowing that we'd be arriving after the office was closed but that turned out to be a breeze. With our keys was a packet of things to do in the area. We relaxed taking long scenic drives and trying out new restaurants. We'll be back again maybe this summer and plan on staying a little longer! Good Location (privacy), Good property, Very Clean. Will go there again. 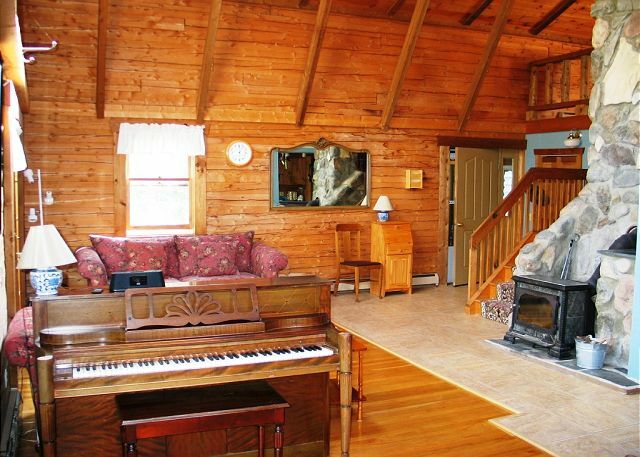 This is a great place for a family, complete with a piano, guitar, lots of games and a basket of local attractions. 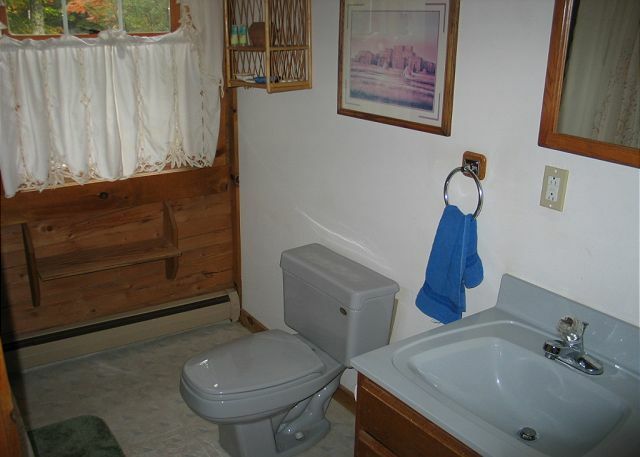 As another reviewer mentioned, the open floor plan does not afford much privacy. The stars at night are fabulous and there is a big outdoor deck for eating and relaxing. It is definitely off the beaten track. A map of the local area would have saved us time as standard maps didn't include the smaller roads. The loft can get pretty warm, especially since the ceiling fan is not directly over the king bed. Usual wear and tear makes some of the cabinets and doors difficult to use. WE HAD A GREAT STAY AT BERRY PATCH PLACE AGAIN THIS YEAR. THANKS FOR MAKING IT AVAILABLE. needs to be finished so it can be used by guests. The management was extremely nice and helpful with information on what to do in the area. Would definitely use them again, but most likely choose another property. (Master bedroom is completely open...not private). The logging operation next door was very noisy during the day. It would also be much better if the single bedroom had a queen size bed in it so it could be used as a master bedroom. I absolutely loved the area I went for a 2.5 mile walk every morning the views were spectacular. Mr. Carson and family- thank you for your positive review in light of the SDS Logging Company's disruption of the general peace and quiet which surrounds the Berry Patch Place. We truly had no idea that the operation was planned and where as surprised to see it as any. I wonder if the "3" rating on location is souly due to the logging operation which will be completed within a few more week's time. This, written on 8.20.10. Oh yeah.... and we will be inviting the Carson Family back on us so that they can really find out how quiet The Berry Batch really is.